Looking for an unmissable crime thriller from a best-selling author? 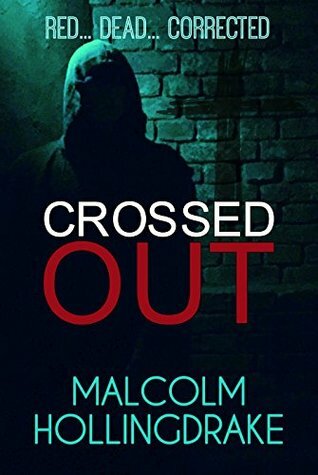 Crossed Out is an intricate and gripping crime thriller from the best-selling DCI Bennett Series. It can easily be read as a stand-alone novel and will appeal to fans of authors like Joy Ellis, Faith Martin, LJ Ross & Angela Marsons. The more that you read a series and the more you expect of the author to come up with something that will welcome you like an old friend and Malcolm Hollingdrake does just that. As each book comes along, this is book six, I have begun to recognise the little traits that make all of the characters individual and that is how it is with DCI Cyril Bennett and DS David Owen. I feel that I know a little more how their minds work as a team and on their own but we all have secrets and pasts, as each new book comes along it is as if a trust builds up between the characters and readers and little more is shared. The story plummets straight into the bowels of the earth, as a sinkhole has partly devoured a house, leaving the occupants on the way to hospital and the search revealing a dead body that has been there for some time. While Bennett and Owen are looking into who the mysterious person can be, a number of remembrance crosses, are turning up with dyed real hair attached in plastic bags and each with an individual number. A further search reveals a murdered person not far from each one. Previously in an earlier book, the death of a colleague hit the team really hard but now is the right time to introduce a very valuable new comer, DC April Richmond. Well I loved this lady straight away and what an asset she is. She brings with her a wealth of knowledge that cements her to this incredible team as if she had been with them years. This is again a top class read and such a busy book that I just couldn’t being myself to put down at a spot that I could stop. A cracking team, a brilliant story line. I just love how Malcolm Hollingdrake pays attention to the smallest detail to make the story as close to real life as possible. There is always excellent research evident in his books. Highly recommended.